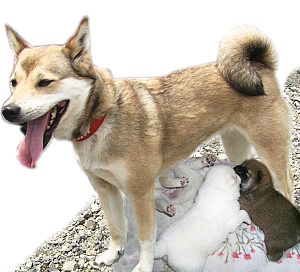 On the fateful morning of October 23, 2004, a dog named Mari gave birth to three puppies in Yamakoshi Village, Niigata Prefecture, Japan. That evening, a severe earthquake struck Niigata and devastated the Village, causing almost all of its homes to collapse, including the one where Mari lived. During the quake the newborn puppies were jolted away from their mother, and since their eyes were still closed, they could not find their way back to her side. 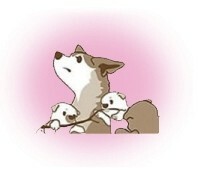 Also, because she was bound by a leash, Mari could not reach her babies. She tried repeatedly to pull free from the leash, but to no avail. Then, several tremors occurred and Mari tried even harder to break free until her neck began to bleed. Suddenly, another strong aftershock struck, Mari struggled with all her might, and the collar suddenly came loose. Next she quickly picked up her puppies, moved them to a safe place, and without taking a rest ran toward the ruins that were once her house. The grandfather of Mari’s family was home alone that day. He lived on the second floor, but suffered from a neurological disorder that made it impossible for him to stand on his feet or climb the stairs unassisted. After the earthquake, the old man was immobilized as he had been trapped beneath a wardrobe. Aftershocks and the total darkness resulting from a power outage pushed him into desperately thinking that death might be around the corner. Just then, Mari appeared in his room on the second floor and looked at him with encouraging eyes. The grandfather had been slipping into unconsciousness, but when he saw Mari he regained awareness although he was still immobilized. Mari then licked him to give him encouragement and went downstairs several times to check on her pups before quickly returning to the man’s room. She ran back and forth many times even though her paws had been injured by the sharp-edged glass and pieces of porcelain that lay all over the floor. Each trip gave her new wounds, but Mari managed to kindle new hope in the grandfather’s heart, and looking at Mari he thought, “I must live on. I cannot give up,” Finally, he pushed at the wardrobe with all his strength, it gave way and he managed to free himself. Then with Mari's encouragement, the grandfather spent two hours climbing down the stairs—a feat he had previously been unable to accomplish without help. Upon reaching the ground floor, he was happy to find that the three puppies were safe and sound. After the October 23, 2004 earthquake Yamakoshi Village was in a state of total destruction and isolation as all local roads had been cut off. And with a continuous series of aftershocks increasing the danger of landslides, on October 25 all the villagers were evacuated by helicopter to a nearby accommodation center. Under these circumstances, the grandfather was forced to leave Mari behind for in times of disaster saving human lives is the main concern. He left all of his pet food for his beloved dog, prayed that she and her pups would be safe and took off her collar. Then, with no other options, as he boarded the helicopter to leave behind the one who had saved his life, he said with guilt and sadness, "I’m very sorry, Mari," and felt heart-broken as Mari howled in deep sorrow. As time passed and her supply of rations ran out, Mari had to search for food in her abandoned village, suffering many ordeals as she tried to protect her little puppies. All the while the grandfather thought of her constantly, and with anxiety over the continuing tremors fell ill and had to be hospitalized. Then two weeks after the evacuation, the villagers were allowed to return to Yamakoshi to see their homes. Among the returnees was the man’s son, who immediately began to search for Mari. Upon finding her, he noticed that she was much thinner, and she hesitated for an instant after hearing her name but then dashed toward him. He held her close in his arms for a long time. Mari had not had enough food for herself, but she fed her babies milk and took care of them as well as she could. In contrast to their skinny mother, the three puppies looked chubby and healthy as they slept sweetly on the porch. The son was delighted to see the little pups growing up in good health. Before Yamakoshi Village was reconstructed, the villagers remained in temporary housing in a neighboring city. Being in charge of advertising affairs for the village committee, the son was a busy man so he placed Mari and her puppies in the care of another family. When the grandfather was still in the hospital, Mari's caretaker took her to visit him. Thus, after undergoing countless trials, Mari and the old man were finally reunited. Mari was very happy to see the man, who was recuperating and said with quivering lips and tears filling his eyes, "Thank you for saving my life." Then in April 2005 the grandfather was discharged from the hospital and began living with his son and Mari in an apartment. By that time Mari's three puppies had been adopted by other families and were growing up healthily in their new homes. Today, the grandfather and his family are still living in the apartment but look forward to returning soon to Yamakoshi Village. 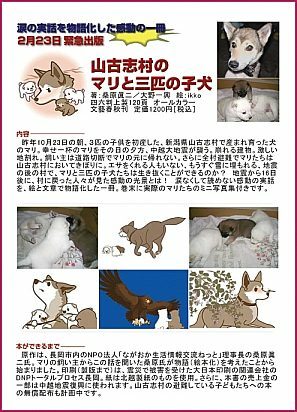 Mari’s touching story, which illustrates the mutual trust and love between humans and animals that helps them through ordeals, has frequently been reported in the news media and has also been adapted as an illustrated storybook — Mari of Yamakoshi Village and Her Three Pups. The book has received a huge response in Japan and serves as a great inspiration for disaster victims. The company that published the volume is contributing part of its sales revenues to the reconstruction and relief funds for areas affected by the October 2004 earthquake, and distributes the book free of charge to children in Yamakoshi Village and its thirteen neighboring cities. On August 2, 2005, the villagers held a fireworks celebration in their city of refuge just as they do in their home town each year, and this year event was entitled “Fireworks for Mari.” While participating in the festivity they wished that Yamakoshi Village could be recovered as quickly as possible. Amid the dazzling light and smoke of the fireworks, Mari's radiant smile seemed to fill the night sky, bringing hope and encouragement to the spectators.